The Broke and the Bookish : Get to Know the Broke and the Bookish: Interview with Tahleen + Giveaway! Get to Know the Broke and the Bookish: Interview with Tahleen + Giveaway! I'm so glad I'm getting a chance to let all of you know a little bit about who I am! I hope you all enjoy the reviews and posts we all write, but it's certainly nice to get to know a little bit more about the people behind the blogs we all read. 1. What is a book that changed your life, and why? 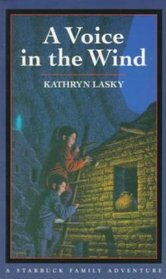 When I was in elementary school, I discovered a book called A Voice in the Wind by Kathryn Lasky. I loved it so much that I ended up checking it out of the library once every summer to reread it—I rarely find a book that I love so much that I'm willing to reread it 8+ times. This book started my deep interest and desire to visit the Southwest. I have yet to do this, but it's been a dream of mine since I read this book. This was my first taste of setting as a character, and I've sought out books set in the same area since. Side note: I was fortunate enough recently to have Kathryn Lasky sign my copy of this! I'm lucky in that I work with books at my job, and for some of my classes. Unfortunately my lit classes have concluded, but I picked up a lot of books that I'd never have thought of otherwise because of them. The best way I've found to slip reading into my life is audiobooks—I commute to Boston for school and have a fiance that lives 30 minutes away from me, so I make use of the time in my car by listening to the books I can't find time to read during the day. I also make time to read, either before bed or on breaks at work. Also, my computer had to be sent off for all of last week and I used the time I usually spend online reading instead—it's so sad how much time I'm on the computer! Me and Bill Bryson's signature! 3. Do you have any authors you'd put on an auto-read list, no matter what they wrote? Well, I actually have yet to read all the works by these authors, but I plan to do so at some point in my life. First of all, Bill Bryson. Bill Bryson is my personal hero and I love everything about him. He is an awesome narrator for his own audiobooks, he is hilarious, he has great perspectives and makes fantastic observations of everyday life, and he is probably the most genial man I've met in my life (I had the great fortune of meeting him for about 10 seconds at the Boston Book Fest last year, but it was probably in my top ten best moments of my life. He shook my hand!). I still need to read a number of his books, but I will get to them in my life. Another author on my auto-read list is John Green, author of Looking for Alaska and Paper Towns , both of which I thoroughly enjoyed. (Though I did like Paper Towns better.) I have An Abundance of Katherines waiting on my bookshelf, and I can't wait for his next work to be published (or at least announced—we're close to getting a title I hear). 4. What is your favorite book from childhood? This scary cover is the one I had! 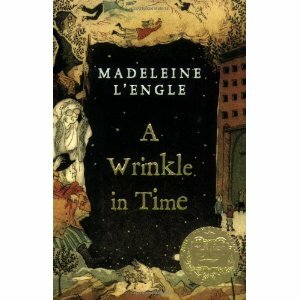 Aside from A Voice in the Wind, my all-time favorite book ever is A Wrinkle in Time by Madeleine L'Engle. As far as I'm concerned, that book is perfect and I will read it over and over again. I still get goosebumps every time I read the line "There is such a thing as a tesseract." 5. Do you have any friends that share your passion? Unfortunately my non-blogger friends and my fiance don't really share my bookish enthusiasm (not to say my fiance doesn't read—he does! He's just not crazy like me), though I try to get them into it. The problem is I love teen and children's literature, which is not an easy passion to share with others. It's part of the reason I sought out an online community with whom I could share my love of books and reading, starting with GoodReads and then moving on to the blogging community. Though, being in the Simmons program has brought me into contact with a lot of great people who read the same things I do. 1. I am a singer (mezzo soprano, woot). 2. I am getting married next May! 3. 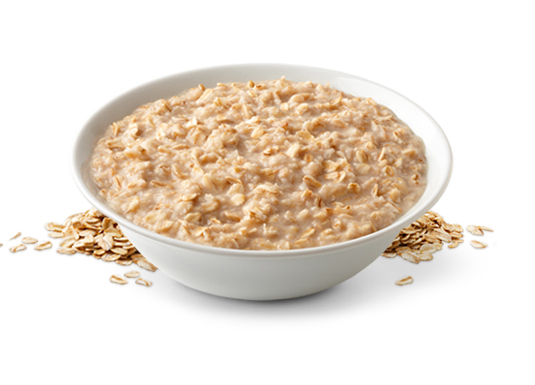 I HAVE to eat breakfast every morning (oatmeal or cold cereal please! ), unless I'm taking communion at church that day. 4. I have an incredibly good knowledge of actors and movies, and often quote the ones that I love the best (Little Giants, Heavyweights, anything with Will Ferrell or Ben Stiller pretty much. Except Meet the Parents and sequels—far too awkward for me). 5. I went to Ithaca College for my undergraduate degree (in English, surprise) and miss Ithaca a whole lot. I've visited the area about four or five times since I graduated in 2009 and hope to visit again! *You do NOT have to be a follower to enter. *You must be 13 years or older to enter. *Giveaway ends June 25, 2011 at 11:59 p.m. EST. That's all for me! If you have any questions, feel free to drop me a line or ask in the comments. Nice to "meet" you Tahleen! Love, love, LOVE Madeline L'Engle. But, are you still in Boston? And is the children's bookstore perhaps Curious George in Cambridge? If so, that is SUCH a great bookstore. I love it too. Anna here- Congratulations!!!! I'm so happy for you on getting engaged! 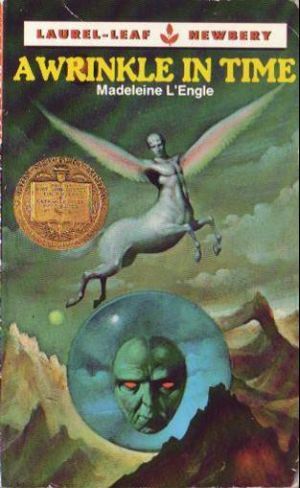 A Wrinkle in Time was one of my childhood favorites as well :) I'm due for a re-read! I also have to eat breakfast every morning. I actually get really sick if I don't eat anything. Congrats on the engagement and good luck with the wedding planning! Thanks for the interview and giveaway, Tahleen! I found it funny that you mentioned Kathryn Lasky, She won some award with a local public library and will be in OK in Aug. I'll have to look up some books by her and check them out! I hadn't heard of her until I read this! Oh man, you met Bill Bryson in real life, and got him to sign our book? That's really cool. I am so jealous right now. He is one of my favorite authors. I remember you mentioning on your blog that you're engaged (or was it in the CS group? ), but I don't really recall if I congratulated you yet. So just in case: CONGRATULATIONS!!! And that old cover really does look creepy! 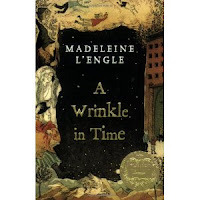 I haven't read A Wrinkle in Time yet, I should get to it soon. Best wishes on your wedding plans! Congratulations on your pending marriage! John Green is definitely on my auto-read as well. I thought Paper Towns was phenom. Although I don't read very much YA, I consider Rebecca Stead's When You Reach Me to be one of the best five books I read last year (I read 123). I've never read anything by Bill Bryson but he sounds interesting. Either book would be a great win. Thanks for the giveaway!